With limited space (man, is THAT an understatement! 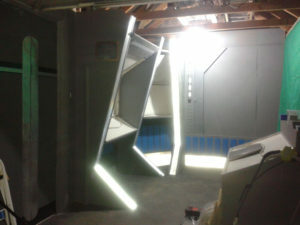 ), Leo spent the next several months constructing physical set pieces that could be used as a bridge for BOTH an Excelsior-class starship and a Klingon bird-of-prey. 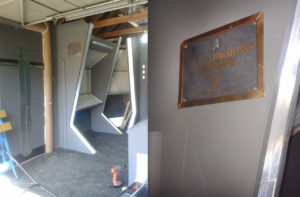 Leo first installed Klingon-style graphic prints on the consoles and readout screens. 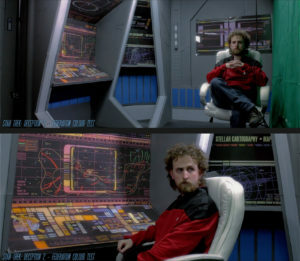 As the weather got colder, Leo spent less time in the unheated garage and more time at his computer adjusting the color (well, he spells it colour) balance to make the lighting look dark and red as a Klingon bridge should. Now he faced the challenge of making the bridge look like it wasn’t some tiny and cramped garage. And later on, Leo needed to take those same sets and somehow make them look like the bridge of a Federation starship! A ton of laughs and some really great, cinematic shots. 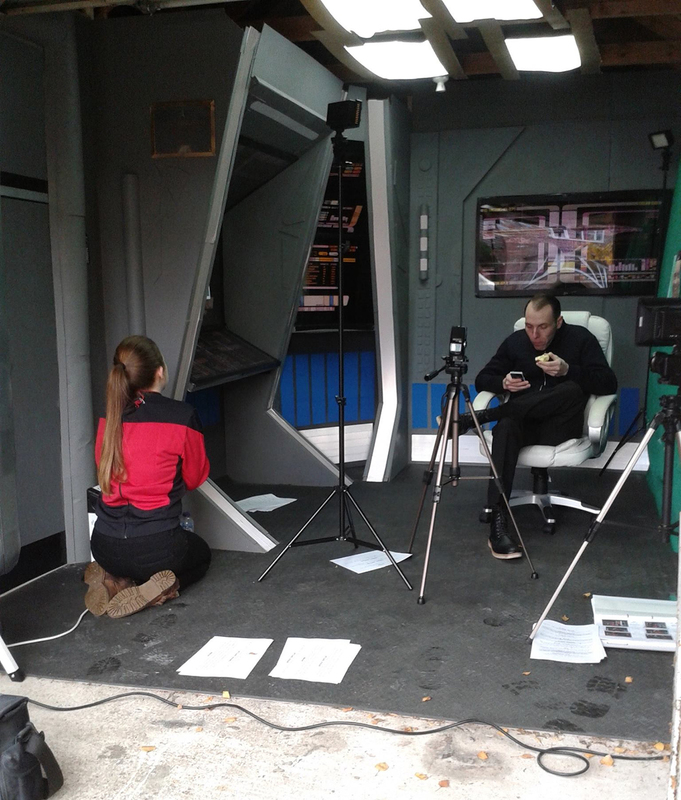 Now to organise the footage, and get the set ready for the next phase of shooting, with the Federation. 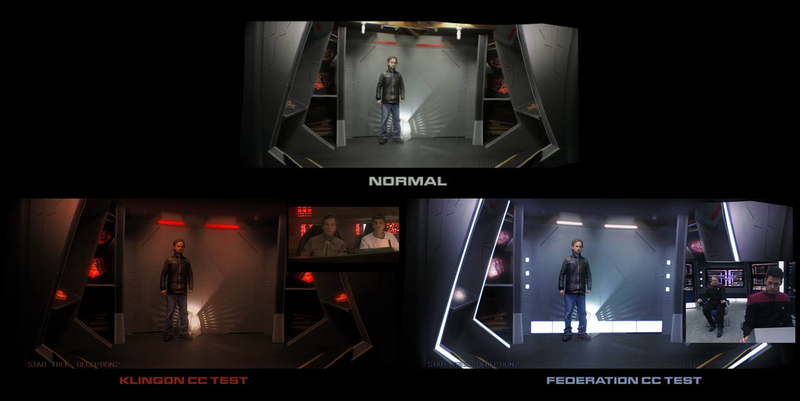 A week later, fans learned that Leo didn’t really like the way the glowing LCARS graphics were looking on camera. For the Klingon scenes, the prints on the consoles were lit from behind and/or from underneath with LED bulbs. But they didn’t really jump out. 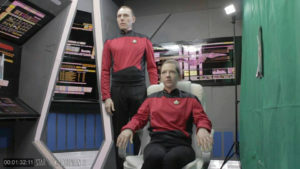 That was kind of okay on the darker Klingon bridge, but on a bright Starfleet vessels, those LCARS computer displays really needed to explode with light. But how could Leo make that happen? Take a moment to scroll back up to the Klingon version of these same sets. I think the difference is truly staggering! Filming of the actual Starfleet actors began in early August, and this photo from the set shows how little space there was to fit in the lights, cameras, and the actors themselves! The next update didn’t happen until October 8 (two months later), but Leo assured everyone that shoots were still happening, and the footage looked great. 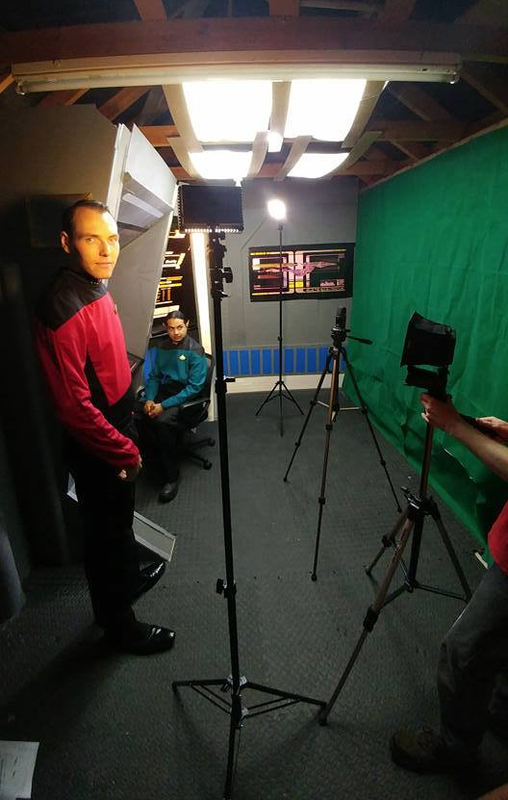 Just a few more shoots to go. I’m not expecting Deception II to be complete for a while yet, probably May 2018, as there is a lot of VFX work to do, plus editing and sound. But I’ll keep you posted. And I, of course, will keep all of YOU posted. 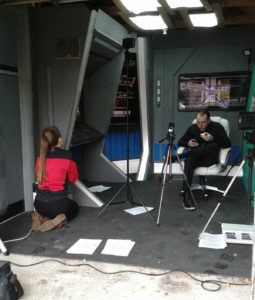 But if you couldn’t tell, I’m really excited to see how this fan film turns out! UPDATE: Deception II was released on October 12, 2018. 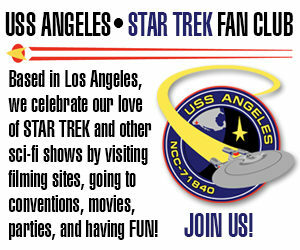 You can watch it and read an awesome interview with show-runner Leo Tierney by clicking here. No wonder it’s called ‘Deception’. I know how err, compact those garages are, which is why most of them rarely have cars in. This is definitely one of the best uses I’ve seen though, beats storing bikes and tools etc. It’s stunning what these fan film makers do with the advances in technology. I too, am excited to see the finished product. 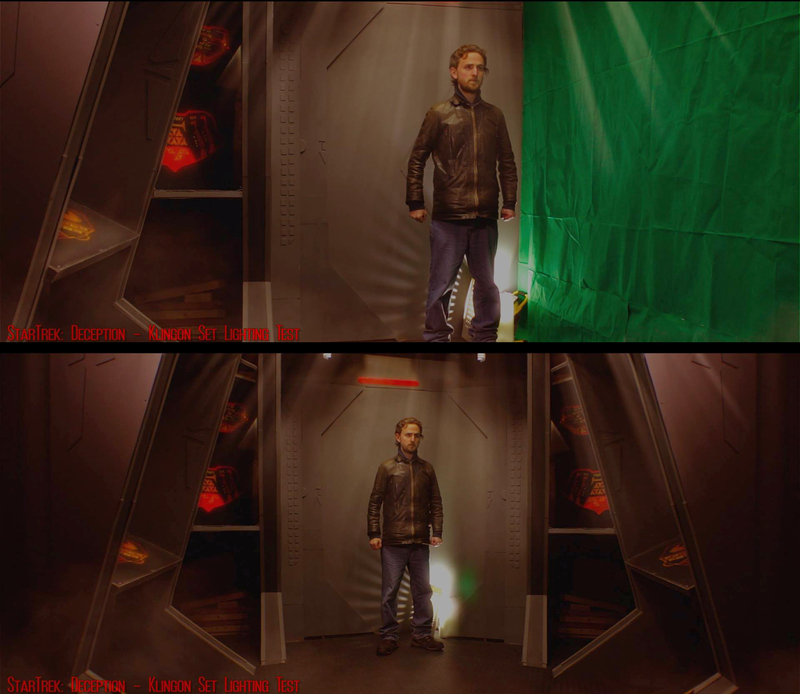 Previous Previous post: THIS is what happens when you ask JONATHAN LANE for a FAN FILM FAVOR! 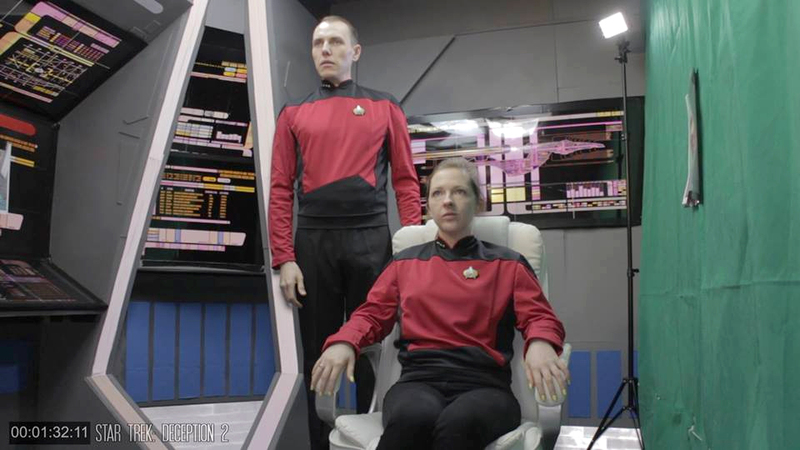 Next Next post: STAR TREK CONTINUES transfers OWNERSHIP of their TOS sets!